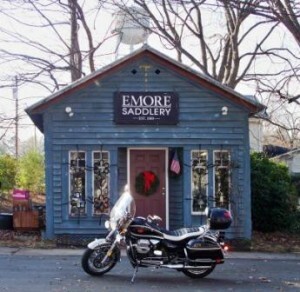 Visiting the Emore Leather Company was not on our agenda when my son and I took one of our weekend rides on the California Vintage to Waxhaw, North Carolina. In fact, I rode past this little old-time shop dozens of times without ever realizing what it was. I finally decided to check it out. We were actually inside a gift shop around the corner when I noticed some really well made leather items with the name Emore on them. The name looked familiar, but I couldn’t remember where I saw that before. Then, I realized that was the name I saw on the old building around the corner, next to the firehouse. When we first opened the door, I thought maybe it was not open to the public. We began to walk inside a working leather shop while the owner was busy making something on the large workbench in the middle of the room. I asked if it was ok that we popped in to see what they do, and the owner gladly approved and asked us to come in. As it turns out, this custom leather shop is quite a hidden gem. I expected to see some riding saddles for horses, and we certainly did as soon as we opened the door. Not only do they make very fine quality goods that the nearby gift shop is selling, but they also make lots of other interesting items in addition to the saddles and repairs to saddles. As we talked, I watched the owner work on some of the nicest and most rugged leather tool bags I have ever seen for motorcycles. 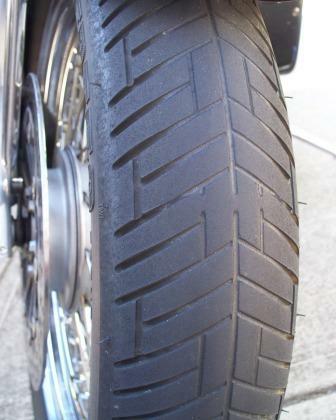 These specific ones were going to a major motorcycle company as extra option items for brand new high-end motorcycles. I then noticed a custom motorcycle seat, leather handlebar grip covers with fringe, a custom two-tone leather dash for a gas tank, some beautiful tan leather saddlebags for a chopper, and other motorcycle leather gear as we talked more. Other items they make (all hand-made) are custom gun holsters, belts, guitar straps, vintage leather restoration work, old-fashioned leather items used by living museums, and of course leather items for horse riding. Need a custom made oxen yoke anyone? If you do, Emore Leather Company can make that, plus a whole lot more. April 2011 update: Emore Leather Company has since moved around the corner from their old building pictured in this article. Their new location doubles as a walk-in store with their hand-made leather goods on display as well as their workshop. The highly custom leather work they do for motorcycles is amazing, but they sell things like grip covers, lever covers, and tool bags too.